Janet was born and raised in Seattle. Drawn to both art and technology, she looks for opportunities to combine the two. She received a BS degree in pure mathematics from the University of Washington, and continued there with three years of graduate studies in pure and applied mathematics. She later became executive producer at Zombie VR Studios. There she designed and produced real-time 3D games for PCs and consoles, and oversaw music video and VR ride projects. After freelancing in Honolulu for a year, Janet returned to Seattle to work with Honkworm International, where she served as VP of Content and created and animated the “photosurrealistic” style of Honkworm’s award-winning FishBar series. She later joined Microsoft, and during her 10-year tenure, Janet worked for Microsoft’s chief research and strategy officer, Craig Mundie, first as a program manager in the Strategic Prototyping group, and later as speech director, working on long-term technology strategy, presentation content and design. Janet is currently Creative Director of Amazon’s Concept Lab, where she leads a team designing new customer experiences 3-5 years out. She is a named inventor on over 8 patents. Janet has has co-curated a number of art exhibitions and continues to create her own artwork. She and her husband, Demi Raven, own a project-oriented creative space called The Grocery on North Beacon Hill in Seattle, where they make artwork and films, and host artists, pop-up exhibitions, and film screenings. She currently serves on King County’s 4Culture Public Art Advisory Committee, on the board of directors at Arts Corps, and in the past has served on the board of directors at the Center on Contemporary Art (COCA) and WorldChanging. 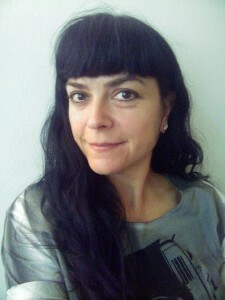 She has contributed to a handful of books on Flash, and wrote Flash MX Design for TV and Video for Wiley Publishing. Contact: janetgalore (at) live dot com. See full resume here. “Artifacts from Baikonur,” conceptual installation and video, at Russia, Mother Russia group show, Shoreline City Hall Gallery, curated by Chris Crites, October 2016. “Raw Material,” a sci-fi surreal horror short film, selected for Northwest Film Forum Local Sightings Festival, October 2016. Co-curator, “Take Three,” an evening of short film at the Northwest Film Forum, September 2016. Appointed to the King County 4Culture Public Art Advisory Committee (PAAC), February 2016. “Waterfall,” projection mapping installation at Duwamish Revealed, August 22 2015. “Chelloveck,” a fictional artifact magazine. Ex Libris group show curated by Siolo Thompson, Seattle, March 2014. “The Imp of the Perverse,” interactive sculpture with perverted toaster; software by Demi Raven. Touch Me: I’m Violent, curated by Yonnas Getahun at Vermillion Art Gallery, February 2014. “Untitled/Gunnilingus,” video short, Bherd Studios Gallery, Second Amendment: A Visual Dialog. June 2013. “From His Lips,” looping video installation at Elvistravaganza, curated by Marlow Harris and Jo David for Bumbershoot, September 2012. “Geist-Hof,” paper sculpture, Lundgren Monuments, Rest in Paper, September 2012. “Deconstructing Blue Boy,” mixed media paint-by-number appropriation. Bumber by Number, curated by Marlow Harris and Jo David for Bumbershoot, September 2011. “Palindrome,” video animation presented as part of Don’t Assume I Cook, at NWFF, 2011. Animation selected for Berlin Director’s Lounge, 2010. Presentation: Inside Microsoft’s ‘Future Home,’ BBC, May 2009. Author, Flash MX Design for TV and Video, by Janet Galore and Todd Kelsey Wiley & Sons, 2002. Contributor, Streaming Media Bible, by Steve Mack Hungry Minds, 2002. Contributor, Flash Design for Mobile Devices, by August DeLos Reyes. Chapter 15: Delivering Content, by Janet Galore Hungry Minds, 2002. Contributor, Flash 5 Cartooning, by Mark Clarkson Published by Hungry Minds, 2001. ResFEST 2000, Sep – Dec 2000, World Tour FishBar 10 – The Delectable Peanut. Yahoo Internet Life, Los Angeles. Best Animated Short Film, FishBar 10 – The Delectable Peanut, June 2000. School of the Art Institute of Chicago, March 2000 Presented a lecture on my curatorial work and the Seattle art scene, performed studio visits with artists working in technology. “Animated streaming – tips, tricks and tools for creating and integrating cutting-edge animated content.” Panel discussion at Streaming Media West 99, San Jose, December 1999. “In-Depth Content Development: Planning & Designing Real-World SMIL Applications”. Presentation at RealNetworks Conference, May 1999, San Francisco. Codrescu, Andrei, Art Silverman, and Larry Massett. “Cynic in Cyberspace.” Radio documentary for National Public Radio. April, 1997. Hear an excerpt of the interview. Codrescu, Andrei. Live online chat with Mark Long and Janet Galore of Zombie. May 5, 1997. Alexander, Joanna, Jeff Close, Janet Galore, and Mark Long. “Welcome to the Next Level: VR Goes Mass Market in 1995.” VR World 3, 3 (May/June): 17-21. 1995.